Have You Referred People To An American Express Or Chase Credit Card In 2018? Nasty Surprises Might Be Coming Your Way! This article today follows emails and social media messages we have received from readers who got a very nasty surprise from American Express & Chase Bank after they referred credit card products to people in exchange for a points award bonus. Referrers have now been presented with a retroactive present for last year: IRS form 1099-MIC requiring the recipient to declare the designated value of all their points they received through referrals to the IRS for tax purposes. Right off the bat: I’m not a CPA or attorney who is deeply familiar with U.S. tax law so I’m not going to chime in on the legalities of this. As far as your personal situation is concerned (especially if you had a lot of such referrals) I suggest you seek out a tax professional for advise on what steps to take. 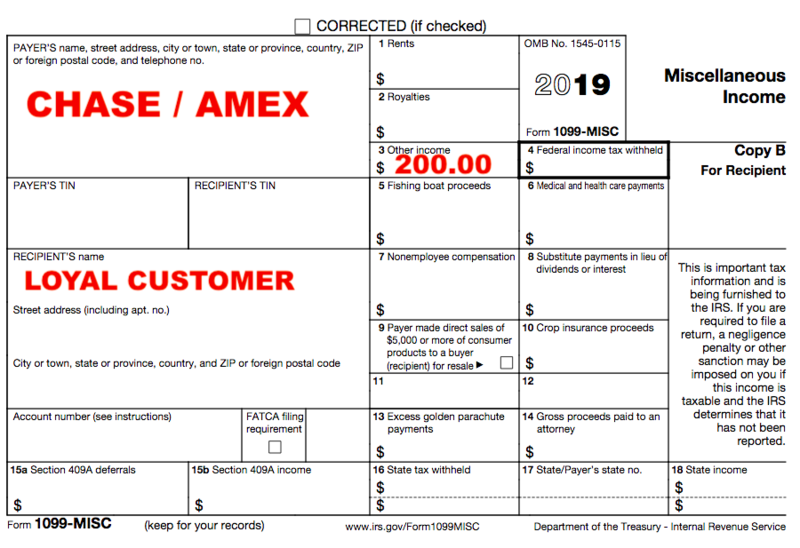 You can access the explanation about form 1099-MISC on the IRS website here. The valuation of these points certainly leaves room for debate. Apparently American Express values their Membership Rewards, Delta SkyMiles and the former Starwood Preferred Guest points at US$ 0.01 so 1 (one) cent per point. So does Chase for their Ultimate Rewards. I would argue that the valuation is fair and actually on the low side but let’s say one doesn’t agree or wants the bank to lower the value on the 1099 it could be worth a short to file a complaint with them. Businesses have the ability to lower a 1099 retroactively but if they will do so is a different question altogether. The financial institutions didn’t disclose ahead of time that referring credit cards through the customer loyalty referral program would eventually result in the issuance of a 1099 and levy a tax burden on them. That alone is a bit unethical in my eyes especially since this drives substantial business for the credit card company. As far as personal sign up bonuses go I was told that those wouldn’t be subject to taxation as the banks now require a minimum spend so it’s not an entirely free bonus. I can imagine there are many for whom this will present a substantial problem. There are a good number of very popular people on Youtube who I sometimes like to watch for their takes on credit cards who certainly process tons of referrals. The same goes for travel and credit card blogs who aren’t operating fully as a business but post their personal credit card referral links instead. Personally I never thought that to be a great idea for the reason we now have on hand. Can you imagine getting hit with 1000+ referrals in value? That’s substantial. Yes, the big travel blogs and I assume professional YouTubers with significant income from ad revenue are mostly a legitimate business entity and file their taxes that way as well but each blog or Youtube starts as a small personal project before taking the leap to a business. I guess a lot of people might find out that the good times of living the high life on free miles & points earned through referrals are pretty much over. Anyway Amex and Chase, this move wasn’t cool at all! Proper disclosure is everything to me and I guess other as well. Based on the messages we got including those on Twitter and Facebook people are obviously not happy about this. Are banks really that strapped for cash at the moment? Yes there are reports of Amex not performing well and they start to put the screws on everywhere but this is weird to me. Why not just lower the awarded points or abolish the program to begin with? In the very least disclose the taxation properly in advance. The answer is of course that this would result in significantly less referrals, drying up even more business for the bank. I’m convinced we haven’t seen the last of this yet either. There will likely be other banks joining the bandwagon. Barclays, Citi and Bank of America are popular card issuers in the U.S. and I haven’t heard from them yet regarding their policies on referral bonuses. Have you received a 1099 from any of them?